This simple carrier is especially good for small babies and requires NO pattern, NO sewing, NO tying. Great for skin-to-skin kangaroo care. While most commercial Dual Pouch Carriers are safety rated up to about 30lbs, for practicality's sake they normally start to sag uncomfortably after about 15lbs. As a safety reminder, stretchy carriers should never be used for back carries. While this carrier is excellent for full-term, healthy newborns, premature infants may need more core support (such as a ring sling or woven wrap) than a stretchy wrap can provide. Please consult your baby's doctor and do not use this style of carrier until the assure you that your newborn is progressing like a healthy, full-term newborn. Find 3 t-shirts that are slightly too small for you. You want seamless t-shirts (no seams/stitching down the sides) that are made of 100% cotton jersey (regular t-shirt material.) Avoid ribbed tank tops or paper-thin t-shirts. You can find cheap t-shirts at thrift stores, solid color t-shirts at most craft stores (on the aisles with tie dye kits and appliques) or check the men’s underwear department at your local big-box store for packs of plain white undershirt t-shirts. Just make sure they are at least a size too small and seamless. Jersey stretches; you want as much support as possible. The ideal size once you have the carrier cut and on is to be thinking, "I barely fit in here; how am I supposed to fit a baby in here, too?!" You will also need a pair of sharp scissors. A sewing machine (or needle and thread for hand sewing) is optional for step 3. Cut all three shirts straight across right below the armpits so you have three seamless loops of fabric. No need to hem; jersey won’t unravel. 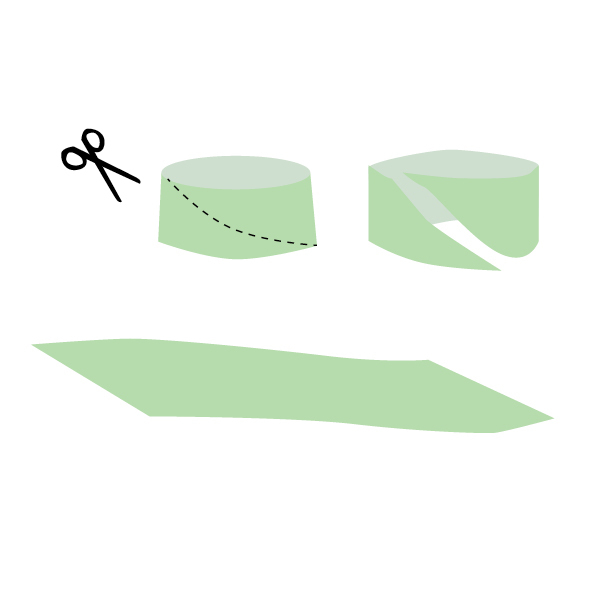 If you choose to hem, use a zigzag or stretch stitch, otherwise the stitches will snap when the fabric stretches. Cut it through ONLY the front layer diagonally from one armpit down to the opposite hip. The result should be a long, narrow parallelogram. Bunch up the two tube pieces and lay them on top of each other. 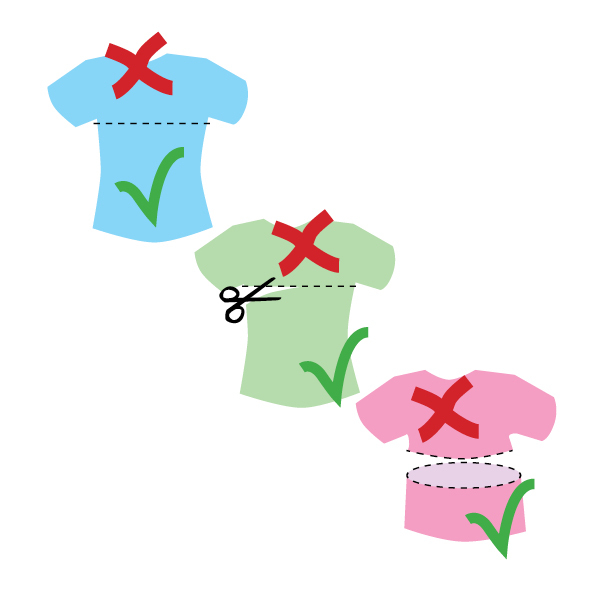 Using a small scrap from the tops of your t-shirts, such as a cut off sleeve, sew or tie your two tubes together at one point. This point will be worn in the back. Put the two cross loops around your waist, with the tied/sewn intersection (if you chose to do step 3) in the back. Pull one loop up over one shoulder. Pull the opposite loop over the opposite shoulder. 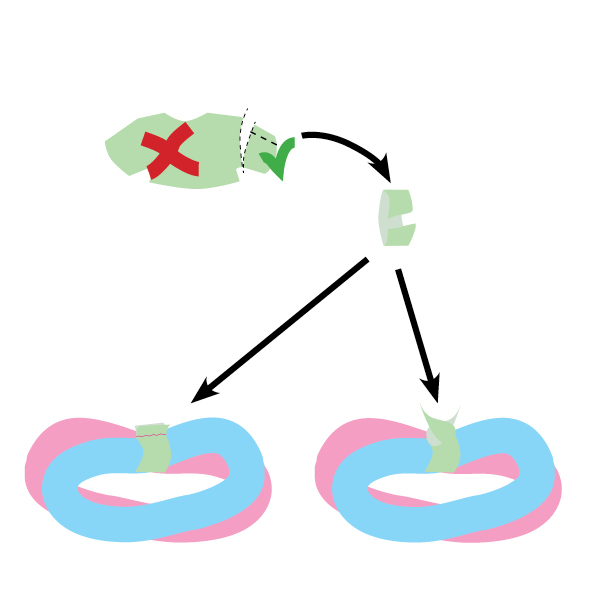 Both loops should make an X over both your front and back. Insert baby upright into the inside sash first, and then the outside sash, with the X crossing between their legs. The X in the front should cross across or below their bum. Spread each pass of the X out so that BOTH passes extend from one of your baby’s knee-pits to the other. The bum should sink down into a little “seat” with the knees slightly higher and supported. Gently press up on their heels to help their hips settle into the "M" position. Don’t spread the fabric past their knees; the knees should be able to swing freely. The baby should have a curved back and be snugly held in a very natural position on your chest. Take the "sash" piece and tie it snugly so the center is on baby's back and the knot is on your back. Spread the sash so it supports from the nape of baby’s neck all the way down to tucked under their bum, so that it comes up to between baby's diaper and your chest/torso and under their knees. Make sure this pass doesn’t cover their feet. This pass should also support knee-to-knee. If baby needs a little extra neck support, lay their head on your chest and pull the loop that is behind their head up over it (so it is covering the back of their head, leaving their airway clear.) If you do this, you can take the edge of the fabric on the opposite sash (the coming down from right by your neck down in front of their face) and pull it away, capping your shoulder. This will keep that pass from interferring with baby's airflow. This video shows how to wear a brand-name K'tan baby carrier. There are some differences, but she thoroughly covers proper technique and fitting. Make sure baby stays upright, supported, visible, kissably close. Make sure baby is always supported by all three passes. Jersey gets saggy with bigger babies, so this carrier is only really a viable option for them when they are very small. This is NOT a safe carrier for back carries. Always refer to TICKS for safety, and as with any stretchy carrier, ALWAYS use all three passes to support baby, even if they are small enough that two passes "feels" safe.